Nintendo is making 2013 a good year for strategists. 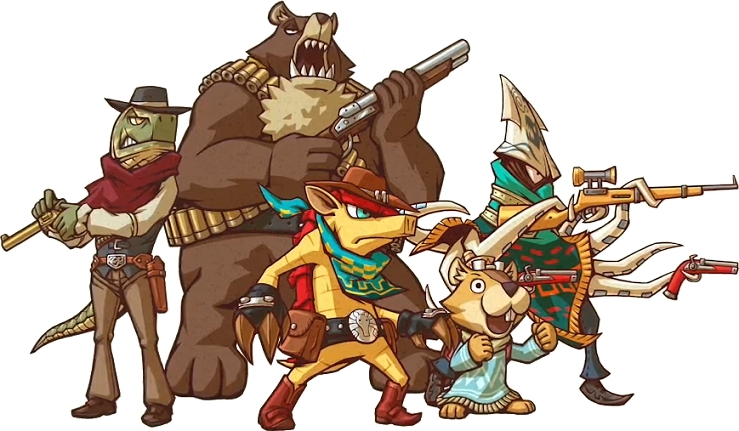 Between the highly enjoyable Fire Emblem: Awakening and the soon-to-be-released Pikmin 3 is an eShop game that includes a heroic Armadillo, rocks that love eating ham, and an untamed western frontier inhabited by an eclectic community of animal citizens. Dillon's Rolling Western: The Last Ranger is a highly accessible, yet mechanically rich real-time strategy game that boasts personality, challenge, and plenty of content. While I have a lot of praise lined up for this game, I didn't roll with Dillon for very long during his first outing. 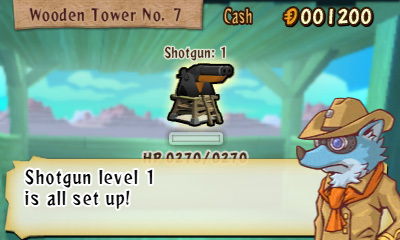 Released last year, the first Dillon's Rolling Western laid down a solid foundation for a new type of strategy game, but I felt that it lacked a certain degree of craftsmanship for its concept to truly shine. Seventeen hours into The Last Ranger, It's apparent that the developers at Vanpool have created the game that I wanted the original to be. Dillon's move set has been enhanced, environments offer a greater level of depth, side characters have a stronger presence, and new enemy types makes for a well-rounded army of bad guys that keep you on your toes. All of these additions and what seem to be shorter loading times rounds out a great follow-up to the original. Unchanged in this sequel is that each level is a three-day battle in which you defend a village from mobile, boulder-like bad guys called grocks. You're given an agreeable amount of time and a set amount of money at the start of a day to set up defenses, help raise livestock, and mine for minerals. Each of these tasks helps you earn money to deal with the relentless waves of grocks, but supplies and funds are limited. Part of the strategy is resource management and defending what you've built up from the destructive grocks. If they demolish a line of defense you've invested a lot of money in, or eat through a village's livestock, the next day's challenges become more difficult as a result. The difficulty level isn't overbearing, but it rarely cools down. While these and other obstacles rapidly pile up, they satiate a desire for variety without over-complicating the game's concept. New terrain, tactics, enemies, abilities, and items are consistently introduced, expanding the potential for strategies and the potential for disasters. The touchscreen-based controls are smooth, allowing the player to stay focused on all of this action. There's even an option for left-handed players too. Once you finish a stage, you can challenge it again with any amount of money that you've amassed. Doing so can be fun in its own right, but you may have to go back to a stage to earn more stars. Stars grant you access to stages that have been unlocked, so a strong performance is key. It's also possible to buy stars, but they cut into your savings pretty deep. If village defense wasn't enough, The Last Ranger adds another scoop to this sundae of challenges in the form of defending a slow-moving train operated by a Turtle. I was worried that this element would be an overwhelming factor, but it actually makes for more exciting game play. There are even unique grocks that prefer to mettle with the train, which I think is pretty neat. 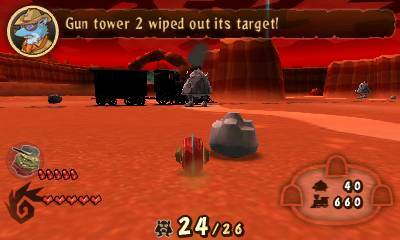 If you choose to take a break from the train's route, there are side missions and bonus stages to tackle. The side missions almost seem necessary at times since they are a source of progress stars, but the bonus stages are purely optional. It's a simple mining mini-game with baddies to beat up, but it's a fun diversion that can help you earn a little extra cash for new equipment. All of this would probably be too much for just Dillon and his sidekick Russ, but there are rangers that can take some of the weight off of their shoulders. 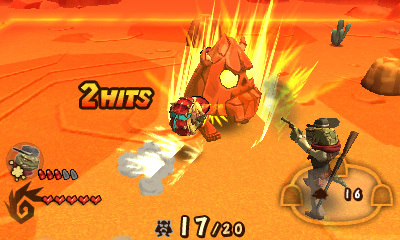 These rangers, Gallo, Boone, and Nomad, can be assigned certain tasks like mining for ore before a battle, and can be directed and fought alongside during one. Directing them is as easy as pressing left on the D-Pad and choosing areas marked on a map. They cost money to recruit, but you'll definitely want the extra muscle. All that aside, they look cool and are just fun to have tag along. I'm not sure how much longer the game is from where I am, but two new levels just opened up and I can't access one of them. I feel like there's a lot of bang for your buck here if you get into what The Last Ranger has to offer. What it does offer is a game that is very similar to its predecessor, but I think the experience is much more refined. I'm glad to see a new IP join Nintendo's ranks, and one of such high quality at that. Now what does it take to get Dillon in the next Super Smash Brothers game? I have been meaning to get the first game for a while as I do enjoy strategy games but haven't got around to it. I would love a home console version. Also, very well written review, I enjoyed it. Just saw this. Great review, October, and great to see someone else loving this game. I really liked the original, but I'd go so far as to recommend newcomers start here. I haven't wrapped it up, yet, but it seems a bit less punishing than the original to me, and the added features are just icing on the cake. Edit: autocorrect changed Octo's name to October. Hilarious. I saw that. It should be his new nickname. Good to hear that it's a step up from the original. I enjoyed that one, so I'm sure to enjoy this even more. I changed the score (9 to an 8) to better align this review with my impression of the game as the credits rolled. The similarity of objectives from stage to stage makes for a fairly rigid gameplay experience, and this aspect wore out some of my enjoyment during the last few stages. I would have liked there to be more elements surrounding the core strategy action to lessen the weight of that core's eventual tedium. I think The Last Ranger is a fun game, although a bit shortsighted. What do you guys think the odds of seeing Dillon in Smash are?